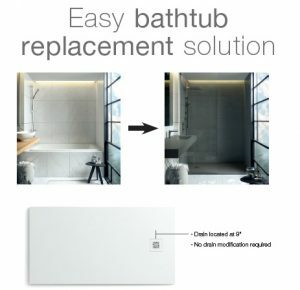 Fiora’s solid surface shower bases of varied sizes and colors now have a drain located at 9’’ for an easy bathtub replacement solution. The Easy-to-install series can be installed above the floor or flushed to the floor, for a more discreet look and/ or for an ADA-compliant design. Extremely adaptable to virtually any space, Fiora’s shower bases can be cut on-site to fit within an odd size setting or to work around an existing structural element.